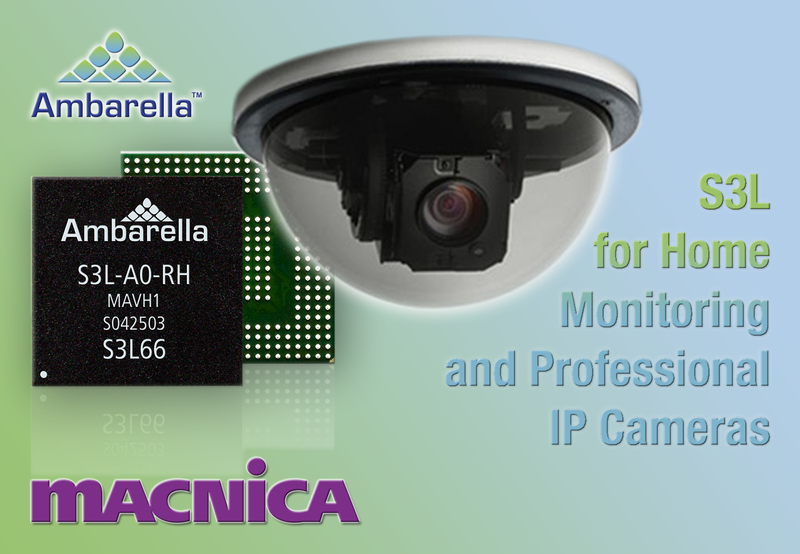 SANTA CLARA, CALIF — January 6, 2016 — Ambarella, Inc. (NASDAQ: AMBA), a leading developer of low-power, HD and Ultra HD video compression and image processing semiconductors, today introduced S3L, a low-power IP camera System-On-Chip (SoC) that enables H.265, or HEVC (High Efficiency Video Coding), video encoding in cloud-based home monitoring and mainstream professional IP cameras. S3L leverages Ambarella's full implementation of H.265 to provide up to twice the video compression of Ambarella's H.264 encoding technology and deliver outstanding video quality at very low bit rates. This improvement results in cost savings from reduced storage requirements and the ability to stream higher quality video over bandwidth-restricted networks. S3L includes multi-exposure HDR (High Dynamic Range) imaging, 180-degree fisheye lens correction and a high performance CPU for intelligent video analytics. "Our new S3L SoC family brings the low bit rate benefits of H.265 to cloud-based home monitoring and mainstream professional cameras," said Chris Day, Vice President of Marketing and Business Development at Ambarella. "Following the introduction of our 4K S3 SoC family last year, S3L extends our customer's performance options to make high-resolution H.265 video even more accessible and cost-effective." Ambarella, Inc. (NASDAQ: AMBA), is a leading developer of low­power, high-definition (HD) and Ultra HD video compression and image processing solutions. The Company's products are used in a variety of HD cameras including security IP cameras, sports cameras, wearable cameras, flying cameras and automotive video processing solutions. Ambarella compression chips are also used in broadcasting TV programs worldwide. Ambarella is the recipient of the Global Semiconductor Alliance 2014 Award for "Most Respected Emerging Public Semiconductor Company." For more information about Ambarella, please visit www.ambarella.com.